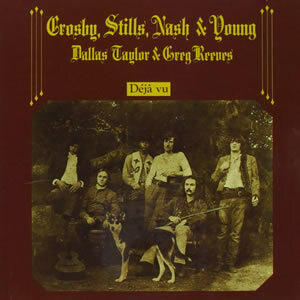 Déjà Vu is the sophomore effort by the super group with the expanded name of Crosby, Stills, Nash & Young, after the addition of Neil Young to the group. Each of the four named members of the group contributed an original composition to each side of the original LP, which worked to give this album a very diverse musical and textual feel overall. following its release, the album topped the charts in the US and went on to be the most successful record overall for the group as a four piece. 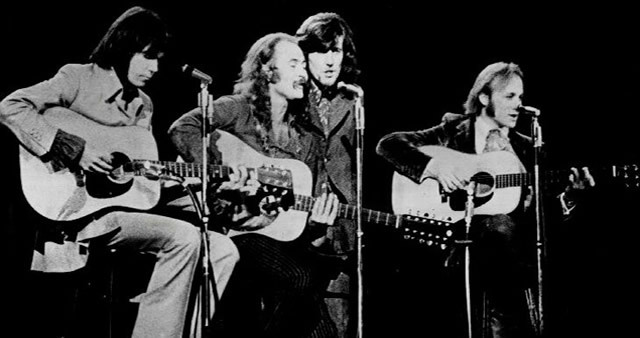 The 1969 self-titled debut by Crosby, Stills & Nash was a critical and commercial success. On that album, Stephen Stills played the bulk of the instruments with drummer Dallas Taylor being the only player outside the core trio. After the album’s release and success, the band looked to add more players, at first trying to recruit Steve Winwood (to no avail). At the urging of Atlantc Records founder Ahmet Ertegün, Young was brought on as a fourth member, reuniting him with Stills, his Buffalo Springfield bandmate. This updated group then embarked on their initial tour in the summer of 1969. Through late 1969, great anticipation was building for another album by the group. Ultimately, the album took a long time to record, with over 500 studio hours logged over the course of five months. The end result is an album filled with precise playing, rich harmonies, and strong rhythms, with three charting singles and several more tracks which have sustained throughout the decades. The songs through most of Déjà Vu are great Americana classics which, if they are flawed at all, are just a bit too short in duration. “Carry On” has an upbeat acoustic folk intro. Still’s thumping bass and some hand percussion are present through much of the opening verses. The later section changes direction a bit while still giving room for harmonies to fully shine along with some great electric guitar licks. “Teach Your Children” is a pure, steady country tune by Graham Nash, featuring exquisite harmonies throughout. This track also has some impressive pedal steel by guest Jerry Garcia, who made this signature arrangement in return for the CSNY teaching members of the Grateful Dead how to effectively harmonize for their upcoming 1970 albums. “Almost Cut My Hair” is a bluesy, hippie anthem by David Crosby, featuring a triple guitar attack by Crosby, Stills, and most especially Young on lead guitar. This track is also the most ‘live’ sounding on the album and features no harmonies, with Crosby alone supplying the soulful lead vocals throughout. The album again changes direction with Young’s “Helpless”, where Neil plays acoustic, electric, piano, and harmonica along with the lead vocals. This track was originally recorded by Young with Crazy Horse in early 1969. The album’s first side concludes with “Woodstock”, a song written by Joni Mitchell as a folk song but adapted by CSNY as a rocked out version with potent, electric guitar motifs and exceptionally harmonized counter-melodies during the choruses. Mitchell did not play at the actual Woodstock festival, but wrote the song based on accounts from then-boyfriend Nash, and recorded her own version for the album, Ladies of the Canyon. Side two of the album contains five more fine tracks, although not quite at the level of the first side. Crosby’s title track, “Déjà Vu”, may be the oddest song on the album, as it slowly works its way into an acoustic groove for the intro section but then abruptly breaks into a slow, bluesy rock for the duration. Nash’s “Our House” is a very British pop, piano love tune, unlike anything this band had done before or since. The song simply portrays a day in the life of Nash and Mitchell verbatim. “4 + 20” is a short acoustic folk tune by Stills, followed by Young’s “Country Girl”, a loose medley with a waltz-like beat, deep organ textures in the background, and slight harmonies. The album concludes with “Everybody I Love You”, the only collaboration on the album (between Stills and Young), which seems like the least finished track on the album overall. Within a year after the successful release of Déjà Vu, each of the four members recorded solo albums — Crosby’s If I Could Only Remember My Name, Stills’ self-titled debut, Nash’s Songs for Beginners and Young’s After the Gold Rush, all four of which reached the Top 20 on the charts. However, there would not be another CSNY studio album by all four until American Dream in 1988, nearly two decades later.